It’s easy on your joints and easy to modify if you have any injuries of any kind. The staff takes great inventory when you first come in on if you have any injuries and will specifically come around and show you a different way to do an exercise if necessary. It’s personal and wonderful. It’s an effective, difficult workout that doesn’t make me soo sweaty that I can wring out my shirt at the end. This is a big deal to me because there have been a few days that I needed to head to work straight after class, and I feel like I was able to do that without being completely disgusting. It’s unlike any other type of workout and works muscles I didn’t know I had. I’ve been sore in places I never dreamed possible, but I consider that a great thing! Pure Barre is wonderful for targeting those super hard to reach problem areas. The vibe in that place is just pure gold. Okay, so I can’t give you any real specifics on this and, at the risk of sounding too new age-y, I just feel like the energy at this particular place is so incredible. It is the staff at Pure Barre Edmond who makes it this way I think- they are always upbeat and knowledgeable and kind, and I just always left feeling better about life (and myself!) than when I came in. 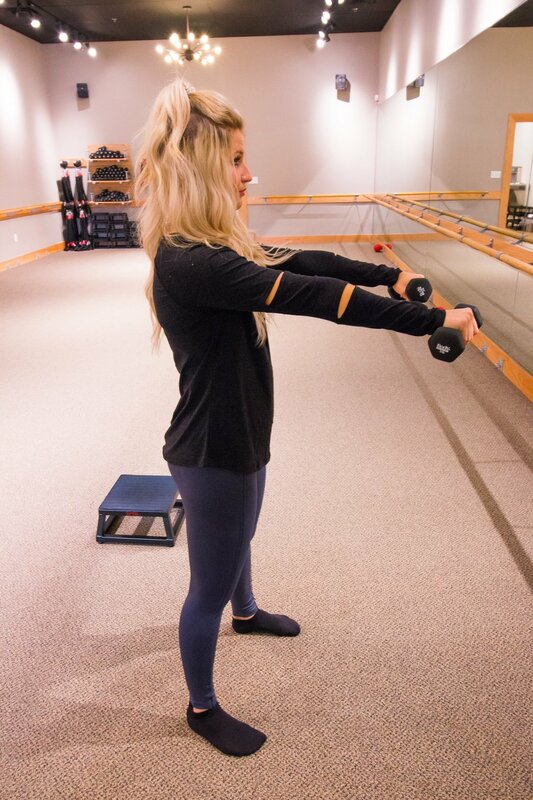 Did you know that Pure Barre also offers 3 different types of barre classes? They’re all very unique. I stole the moves you see above from the Pure Barre Classic class. This is the original barre class and targets the entire body to create long, lean muscles. My favorite part: The extra stretches after working a particular muscle group (by the way the stretching at the end is my favorite part of every class so we’ll just get that out in the open). My least favorite part: The 90 second plank. I dreaded it each time, but I will say, I definitely impressed myself with how long I was able to stay in it as I went. Pure Barre Empower is my favorite of the 3! This one is only 45 minutes and combines strength training with cardio circuits. I’m kind of a cardio interval kind of gal when it comes to workouts typically so this was right up my alley. My favorite part: The quick moves and faster pace. My least favorite part: The sweat. Hence my earlier point. Haha this one will definitely increase your heart rate a little more so plan accordingly. If you’ve never given Pure Barre a try, I definitely recommend it at least to see what you think! If you’re local to the Edmond area, you can contact Pure Barre Edmond HERE to set up a week of unlimited classes for only $29 if you’ve never tried it before! They also sell all of the workout wear that I was wearing in this post (plus toooonnnss of other cute workout gear!) in store at Pure Barre Edmond so be sure to check that out if you’re local too!